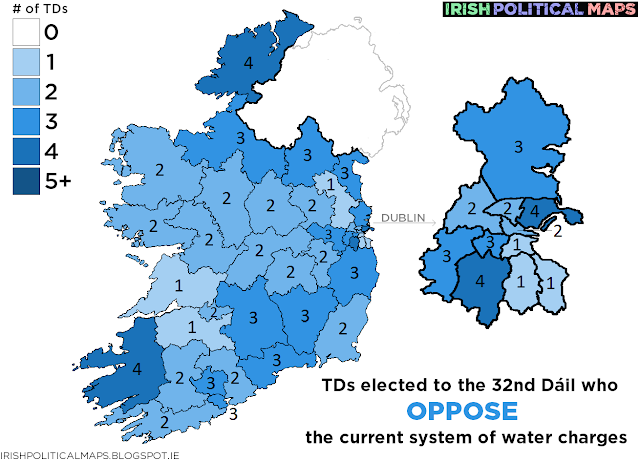 Irish Political Maps: How many TDs oppose water charges? How many TDs oppose water charges? As we continue to wait for a government to form, several politicians and commentators have raised the point that the majority of TDs elected to the 32nd Dáil are opposed to Irish Water and the system of water charges introduced by the Fine Gael-Labour coalition government. With Sinn Féin, the AAA-PBP, the Social Democrats and the majority of independents all against water charges, and Fianna Fáil campaigning and negotiating to have the charges shelved for nine months (accusations of stolen policies aside), that does seem to be the case, so I made a map to see what this majority would look like. When researching for this map, I found that it wasn't always easy to get information on every TD's view of the matter. As the election results were coming through in February, Brendan Ogle of the Right2Water campaign said that 99 anti-water charges TDs had been elected. By my count, there are 95 - though I'm more than happy to adjust the map if I've made an error somewhere. Fine Gael, as the party which began this policy in the first place, remained steadfast during the election and its aftermath that water charges were necessary. In the election, Fine Gael held 50 seats, including that of the outgoing Ceann Comhairle Seán Barrett. The Labour Party campaigned during the election for a publicly funded water utility based on a fixed charge, with metering to assist in water conservation. Comments from Labour TDs since then have been mixed, but since each of them were part of the government which introduced the charges, I am counting them as "for" the charges. In the election, Labour held 7 seats. The Green Party consider water charges an important environmental policy, and leader Eamon Ryan has said the charges should stay. In the election, the Greens won 2 seats. Independent TDs Noel Grealish (Galway West) and Michael Harty (Clare) have spoken in favour of the water charges. Michael Lowry (Tipperary) has previously encouraged his constituents to register with Irish Water. Michael Fitzmaurice (Roscommon-Galway) has been difficult to place as he supports water charges as a conservation measure, but all he has said on the matter lately is that a "responsible debate" is needed. As he has not come outright against the charges, I'm counting him in this group. Fianna Fáil, when in government under Brian Cowen, had drafted legislation to introduce water charges in the weeks before the bailout. However, the party opposed the coalition's handling of the issue and campaigned for water charges to be suspended. This suspension became part of the agreement made with Fine Gael last week. In the election, Fianna Fáil won 44 seats. Sinn Féin has opposed the water charges since their introduction and was part of the Right2Change movement. In the election, Sinn Féin won 23 seats. The Anti-Austerity Alliance/People Before Profit Alliance (AAA-PBP) have also always opposed the water charges, and were also a part of the Right2Change movement. In the election, the AAA-PBP won 6 seats. The Social Democrats pledged to abolish water charges as part of their election campaign. Independent TDs (including members of Independents4Change and the Independent Alliance) who oppose the current system of water charges number to 19 seats. The independents in question all have different ideas about water charges and how the issue should proceed, but they are united in their opposition to the current system. The independent TDs I have counted are: Tommy Broughan (Dublin Bay North), Seán Canney (Galway E), Joan Collins (Dublin SC), Michael Collins (Cork SW), Catherine Connolly (Galway W), Clare Daly (Dublin Fingal), John Halligan (Waterford), Seamus Healy (Tipperary), Danny Healy Rae and Michael Healy Rae (Kerry), Finian McGrath (Dublin Bay N), Mattie McGrath (Tipperary), Kevin Moran (Longford-Westmeath), Denis Naughten (Roscommon-Galway), Maureen O'Sullivan (Dublin Central), Thomas Pringle (Donegal), Shane Ross (Dublin Rathdown), Mick Wallace (Wexford) and Katherine Zappone (Dublin SW). With 95 TDs who wish to either reform or abolish the present system of water charges, and only 63 (at most) in favour of the status quo, it's clear that the mandate of the people is with those against. Whatever shape the new government takes, this is a consideration it will have to take on board when it approaches the issue of water charges again after the agreed delay of nine months.